Somewhere in all of your research you have probably read something about the little wheat protein called gluten that is causing a big fuss. Perhaps, you may be one of many people who is noticing the ever expanding Gluten-Free section at your local grocery store. What is the big idea with this little grain? After all, we have been eating it all of these years right? So why is it being ever so publicized today? Maybe perhaps it’s just a fad-diet? Well fad diet or not this gluten-free thing is here to stay, and it may be contributing to how you are feeling, especially those who have thyroid related issues. Gluten Sensitivity? I’ve already been screened for Celiac Disease! One of the first things people think of when they hear the word “gluten” is celiac disease. Or you may have even read the first 3 references to those papers listed above and noticed that all of those studies were people who had celiac disease. Or perhaps maybe even you have been tested for celiac disease by your doctor only to find out that those tests were negative. 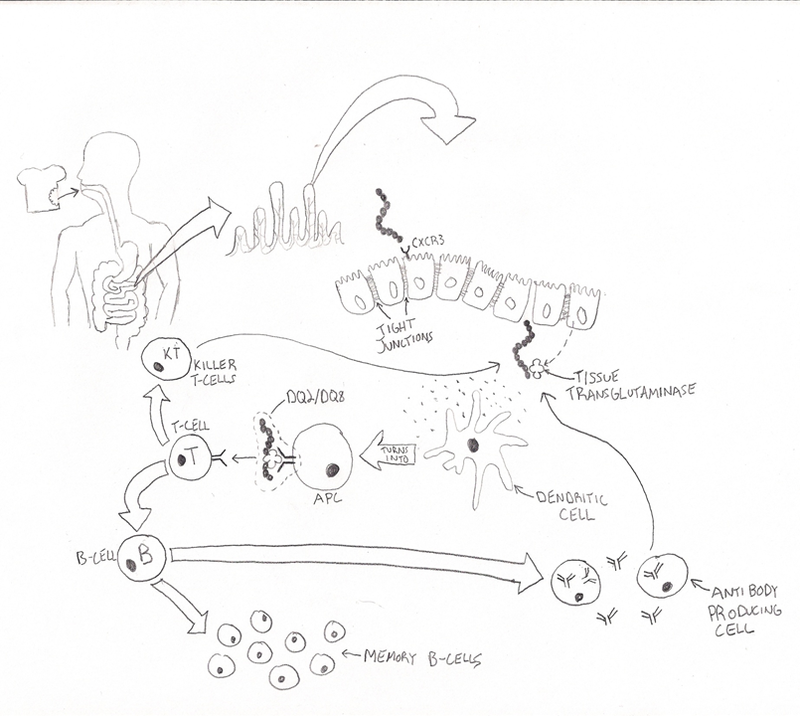 Those with celiac disease have a genetic variant (primarily in a gene that regulates HLA-DQ2.5 and HLA-DQ8) that can upregulate the immune response extremely to gluten. What is also important to know is that in order to be diagnosed with celiac, you have to show antibodies to wheat and there has to be total villous (gut cell) atrophy(4). This is done by an intestinal biopsy. So what happens if someone shows up with antibodies towards gluten and they don’t have complete villous atrophy? You will probably be told that you don’t have Celiac disease, and your doctor may even give you the green light to eat whatever you want. The problem with that thinking is that the more you continue to eat something that your immune system is reacting to, the more inflamed you will be and the greater your chances of developing an autoimmune disease are. In fact, having immune reactivity towards gluten is so common now that a term Non-celiac gluten sensitivity is popping up more and more in the literature. We also know now that having reaction towards gluten doesn’t have to manifest itself as problems in the gut. In my patient population the most common symptoms of people who have gluten sensitivities are actually neurological and not related to the gut. If I had to give a ratio I would say around 2/3rds of people with gluten sensitivity primarily we will see brain fog, fatigue, and pain as a manifestation of symptoms. The other 1/3rd we will see gastrointestinal symptoms. This is actually somewhat consistent with this small study (5) in which they had 10 people with headaches, walking abnormalities and elevated antibodies towards gluten. What they did is put them on a strict gluten free diet and they found that 7 out of the 10 people had almost complete resolution of their symptoms. What was also interesting is that 6 out of the 10 patients had no intestinal complaints whatsoever, this is very close to the 2/3rds of people I see. There have been many research papers demonstrating that having not only celiac disease, but gluten sensitivity alone can contribute to a whole host of issues outside of the intestines, such as: brain issues (headaches, ataxia, altered neurotransmitter production, schizophrenia, anxiety, depression, ADD), peripheral nerve disorders (pain, carpal tunnel, idiopathic neuropathies), skin issues (dermatitis hepetiformis, psoriatic arthritis, alopecia, dermatomyositis) and thyroid issues. (6, 7, 8, 9, 10, 11, 12, 13, 14, 15, 16) One study in particular showed an increased prevalence of antibodies to gluten in those with autoimmune thyroid diseases who did not have celiac. 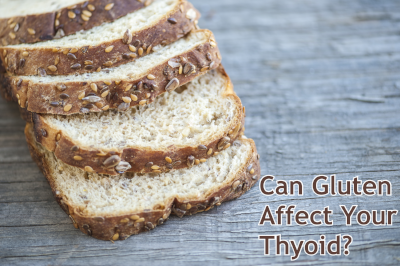 (6) Because of the implications gluten sensitivity has with various other systems in the body, one has to suspect that it may play an important role in thyroid dysfunction, especially if that dysfunction is caused from an autoimmune disease. Since gluten sensitivity is slowly being recognized as a separate entity to celiac disease, the chances of it being under-diagnosed are greater. More recently in the literature there has been a discovery (21) of grains that have been deemed to cross-react with gluten. What does it mean to “Cross-react”? It means that the amino acid sequence of one structure closely resembles that of another structure. When two structures look similar our antibodies can target the unwanted structure thus generating an immune response to a completely different compound. This research done by Aristo Vjdoni, may have the answer to why some people can experience amazing results while going gluten free while others don’t really experience any change. The paper has shown that certain grains as well as human tissue can “mimic” the peptide found in gluten called gliadin. The table listed below is pulled directly from the study. I have added an extra red line to demonstrate the cut off compared to the control group. Anything above that red line should be suspect of being cross reactive. Anything that is either at the red line or below is considered to not be cross reactive. What types of implications does this research have clinically? Well as mentioned above those who have done a gluten free trial and have not experienced relief may have been eating grains/other foods that were cross reactive and thus perpetuating the inflammatory immune response. To those with thyroid related dysfunction I would recommend an elimination diet for up to 6 months (or 2 years if you have celiac disease) OR until you have a resolution of symptoms. Why 6 months? Well according to some research (22) that’s how long it takes for the majority of the immune reactivity to gluten to disappear in those without celiac. Because Celiac disease has a heightened immune response to gluten around 40% of patients still had persistent antibodies after 6 months of being gluten free. Keep in mind the importance of adhering to the diet. When we are talking about immune reactivity in food, even very small particles are enough to “reignite” the immune response. You have to be 100% compliant. I will usually tell my patients to follow a tighter diet until they start to feel better, then to slowly introduce the foods one at a time. Sincere thanks to Dr. Scott Beyer of the Integrative Brain and Body Family Wellness Center for this guest blog.